The practice of eating mostly plants is a key lesson from centenarians living in Blue Zones, five unique communities that have common elements of diet, lifestyle and outlook on life that have led not only to an amazing number of years lived, but also a better quality of life. Most Blue Zone centenarians never had the chance to develop the habit of eating processed or junk foods. Traditionally, many ate what they produced in their gardens and supplemented with staples like durum wheat, maize and sweet potato. They avoided meat, or more accurately, didn’t have access to eat except on rare occasions. Studies of thousands of vegetarians have found that those who restrict meat are associated with living longer. However, that is not to say that all vegetarians are equal. There are many vegetarians who take in more cholesterol through dairy (cheese, milk, etc.) and other processed foods than some non-vegetarians who eat meat at modest levels. I personally experienced this many years ago. I’ve been a vegetarian most of my adult life. As a child, I just never liked meat or fish very much, so when I became an adult I just removed it from my diet. Many years ago, when I was in my early 20s, I was surprised to find out that I had slightly high cholesterol. How could this be? I asked my doctor, I’m a vegetarian! I was shocked; and, so began my education to eating wiser and making healthier food choices. Finding out my cholesterol was higher than I would have liked shook me up a bit. Like inspector Renault’s famous line in Casablanca, I decided to “round up the usual suspects” and identified the “offenders” in my diet. Although I was not eating meat, I was eating a lot of cheese, ice cream, milk shakes, junky chocolate, processed foods and french fries. Hardly any greens or fresh fruit were passing my lips. I analyzed what I could remove from my diet, or at least eat less of, and did some reading to find out what I needed to include to bring more balance to my diet. I immediately increased my intake of a variety of colorful fruits, vegetables and legumes, got rid of many of the “offenders” and started moving (exercising) more. By my next doctor’s visit, I was happy to find my cholesterol levels were great! The key to eating well is not just to eat less meat, but also to find a healthy balance—consume what your body needs and avoid the extremes. Although not all Blue Zone centenarians are vegetarians, they consume limited quantities of meat. Beans (legumes), whole grains, and garden vegetables make up the bulk of all longevity diets. Also, studies indicate that nuts, eaten in balance and moderation, may help protect the heart by reducing total blood cholesterol. Studies also showed that persons eating nuts at least five times a week, in two-ounce servings, lived on average about two years longer than those who didn’t eat nuts. However note, a one ounce serving of nuts typically ranges from 165-200 calories, so two ounces could easily be almost 400 calories. Think carefully of portion size if you have concerns about weight. At home, we add organic nuts to our oatmeal/breakfast porridge every morning. I don’t always eat as many fruits and vegetables as I should everyday, but thinking about the upcoming Health Challenge and reviewing the lessons from the Blue Zones have been a gentle reminder for me to try harder. So far, I’m raising my son as a vegetarian. When he is older he can later decide if he wants to add meat to his diet. For now, I’m happy to train his taste buds to love and appreciate a variety of fruits, vegetables, whole grains and legumes from an early age. Fortunately, he likes a variety of healthy foods. I can’t help but smile every time he picks up his vegetables and puts them in his mouth with his little pudgy fingers and says, “I like it!” I hope his early love of plant foods remains with him throughout a long, healthy and happy life. Blue Zone diets always include at least two vegetables at each meal. Try to limit meat intake to twice per week. Make beans and legumes the centerpiece of lunches and dinners. Although all nuts are considered good, the best nuts for longevity seem to be almonds, peanuts, pecans, pistachios, hazelnuts, walnuts, and some pine nuts. Others such as Brazil nuts, cashews, and macadamias are less desirable as they have a little more saturated fat. Toss nuts in salads, pasta or yogurt. A small handful of unsalted raw nuts can make a nice snack, but as nuts are a high-calorie and high-fat food, practice eating them in moderation. Next post: Lesson number four from the Blue Zones, won’t you join me? 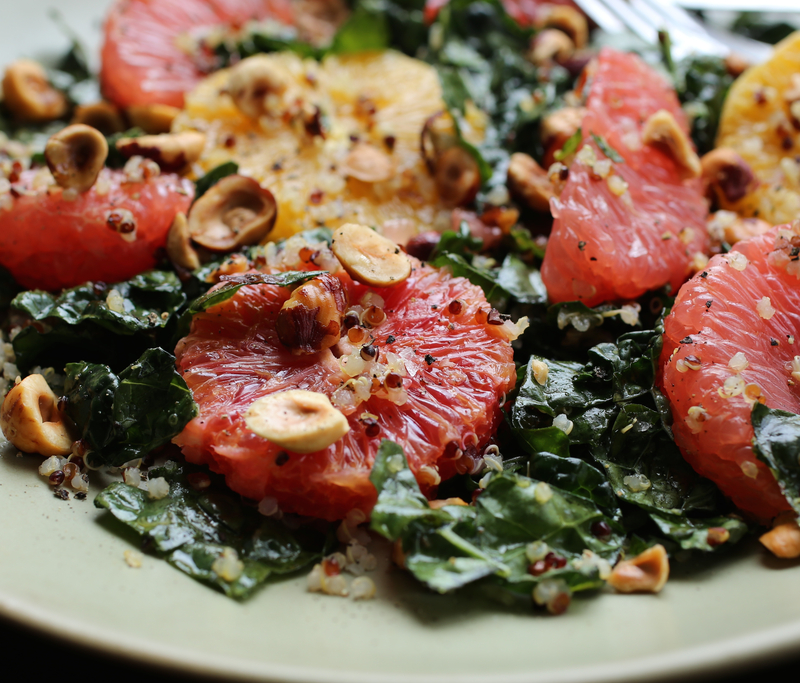 I love citrus salads; I find them so refreshing. Here, the addition of quinoa and toasted hazelnuts adds a boost of protein and a satisfying crunch. Add quinoa to a saucepan of about 1 cup of boiling water. Cook until tender, about 10 minutes. Drain well and place in a bowl or spread onto a baking sheet to allow to cool. In a large bowl whisk to gather the olive oil, vinegar and honey. Season with salt and pepper. Add chopped kale and using your fingers, massage the leaves until they are well coated. Allow leaves to absorb dressing and soften. Meanwhile, using a sharp knife, remove the skin and pith from the grapefruits and oranges. Cut in between the membranes of the grapefruits to release the sections; discard the membranes. Cut the oranges into thin rounds. Set the grapefruits sections and orange slices aside. 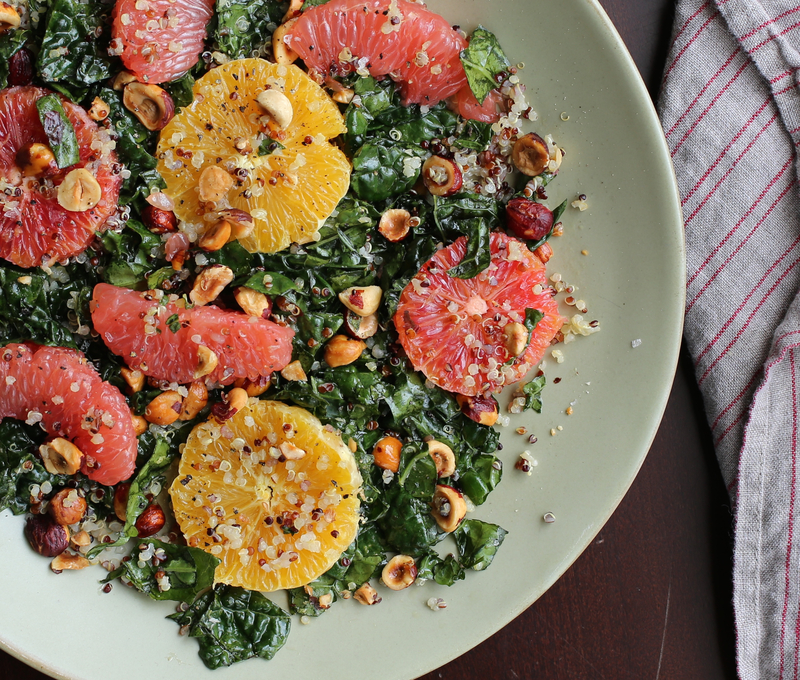 Add quinoa to the bowl of kale and toss. Gently add grapefruits, oranges and hazelnuts and toss gently to coat. Sprinkle a little salt and pepper and serve. Hi Tanya, fate it is! So glad this seasonal recipe and post came exactly when you could use it! Thanks for letting me know. Your son is very blessed to have a mama like you who can cook up such gorgeous and delicious foods! I’d be eating all my veggies, nuts, grains etc and saying “I like it” too if I ate food like above!!! :) Can’t wait till your health challenge!!! Thanks Yoomi! I didn’t think he’s enjoy chewing on all the kale, but surprisingly he really liked this salad and asked to eat some of mine when he was down with his serving. 😉 Looking forward to having you join the Challenge! It will be great for us to all support one another!